As CAIR and left-wing Marxist groups wage war on Conservatives and pro-Americanism, Representative Ilhan Omar (D-MN) has come under fire yet again, as she is now working behind the scenes, holding secret fundraisers for groups with ties to terrorism, and who have waged war on America and Israel! In what should be of no surprise being Rep. Ilhan Omar has gone on anti-Semitic tirades, now it has been revealed that she is holding a series of secret fundraisers with groups that have been tied to the support of terrorism. Her appearances at the fundraisers have been closed to the press and hidden from public view, combined with the fact that the Mainstream Media refuses to report any indiscretions by left-wing radical politicians that support the advancement of anti-Trump impeachment, it has created a climate that fosters Marxist ideology, anti-American hatred, and a war on our Constitutional Republic! To date, Omar’s comments at these terror-tied organizations have remained elusive to her critics, but she is being paid by these organizations! For example, in Florida, Omar spoke at several venues including a private event in Florida that was hosted by Islamic Relief, and a CAIR-CA PAC! The Islamic Relief charity organization has deep ties to groups that advocate terrorism against the Jewish people in Israel. They also have come under Congressional investigation for their providing assistance to both terrorist organizations known as HAMAS and the Muslim Brotherhood. Furthermore, a number of countries have banned the group, as a result of these ties. Also in 2017, Congress worked to ban taxpayer funds from reaching the charity due to these terror links, but the now left-wing radicalized Democrats blocked the effort! 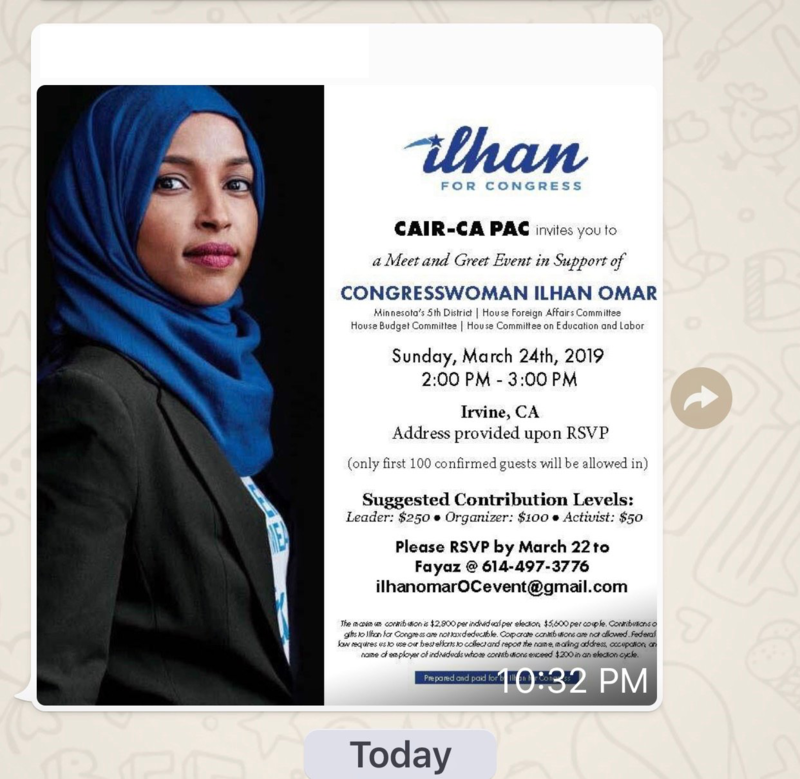 Also, the private event in California was hosted by CAIR-CA PAC, which is a political action committee affiliated with the Council on American Islamic Relations, or CAIR, which was named as an unindicted co-conspirator in a massive terror-funding! Yesterday, Rep. Ilhan Omar held another meet and greet in Irvine, Calif., for CAIR-CA PAC. Those wishing to hear Omar speak are being asked to donate anywhere from $50 to $250 dollars, according to a flyer for the event. CAIR is just one of the more prominent Muslim Brotherhood Groups developed in the United States. Radical Islamic Jihadist organizations like CAIR (Council on American-Islamic Relations) chapters implement the ground game, including by threatening or bringing lawsuits to towns, companies, and individuals. At one point the American FBI (Federal Bureau of Investigation) was even using CAIR to train officers until the conservative media was able to reveal the truth behind their organization. “Rep. Omar’s presence as a keynote speaker to raise funds for Islamic Relief USA, whose parent organization and chapters have documented ties to terrorist organizations, demonstrates that she has learned next to nothing over the last few weeks when she was reprimanded by your office and by other Democrats for posting ugly, anti-Semitic attacks on Jews and their organizations”. “more personal” than Jews whose parents had survived the Holocaust. Sadly, it is just one of the latest disgusting attacks on Jews, as the Democrat Party is finally exposing their true racist and hate-filled roots! To write off the plight of the Jewish Holocaust survivors families as meaningless, and to defend an admitted racist and openly radical Muslim who has said that Israel should be eliminated from the map is beyond sick, IT IS INDEFENSIBLE! Sadly, by Wednesday evening, Democrats passed a resolution that didn’t condemn Ilhan Omar’s (D-MN) racist and anti-Semitic comments, but they actually allowed Omar herself to change the wording! In the end, they passed Omar’s anti-Hate speech bill that condemned all hate speech, but focused on anti-Muslim speech, rather than the anti-Semitic speech that Omar used that was the reason for the bill in the first place! In other words, the Democrat Party is now openly a racist organization, and allows hate to be utilized within their own ranks! Ultimately, it is a sad day for the Democrat Party and a very sad day for America!